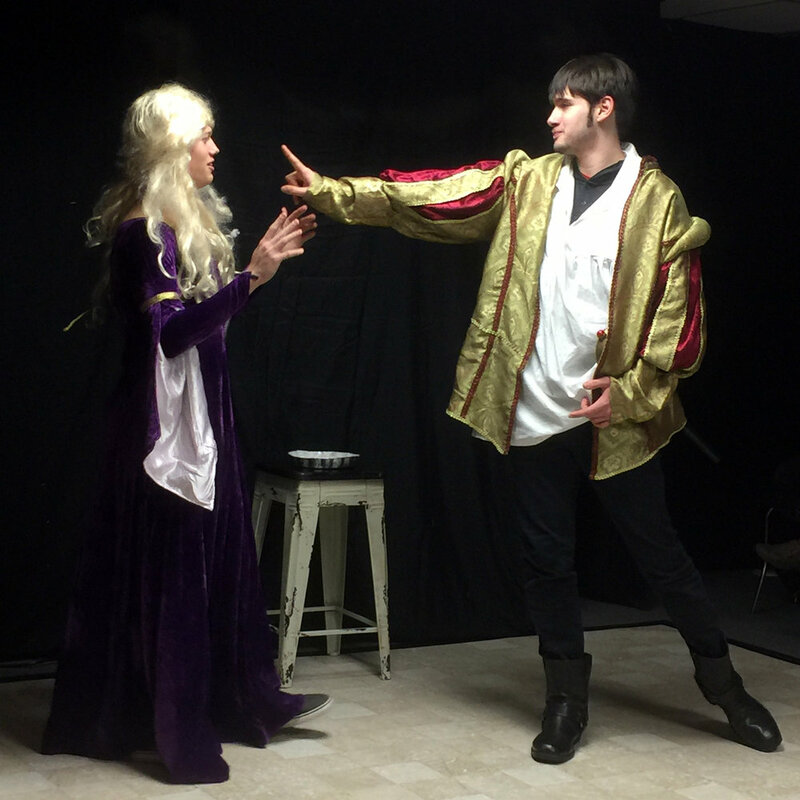 GWCS’s Bit Off More Than We Could Chew Players’ winter production of I Hate Shakespeare! 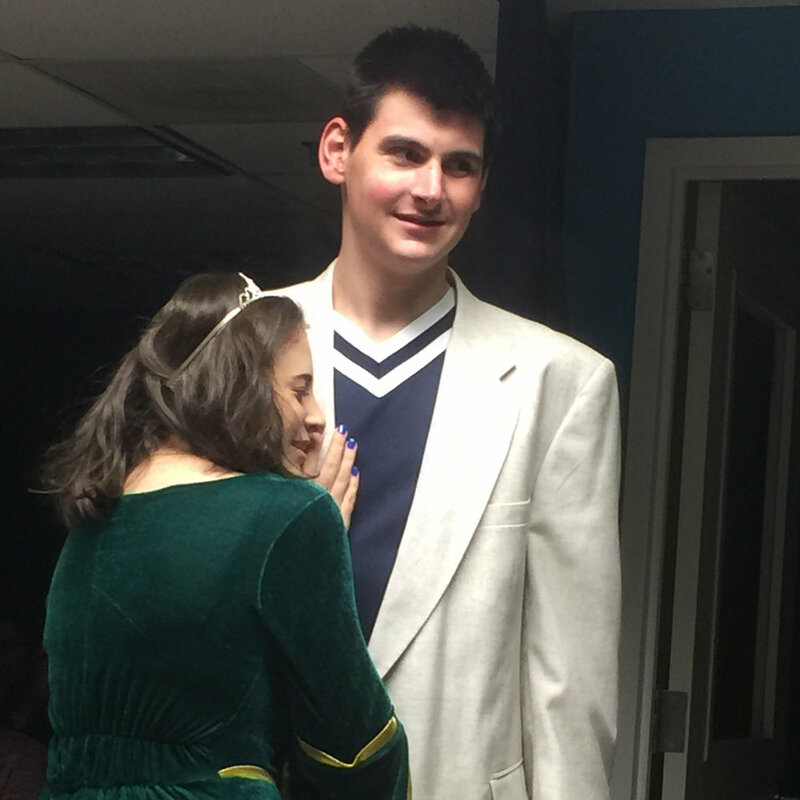 was a sold-out success for its late December two-night run. 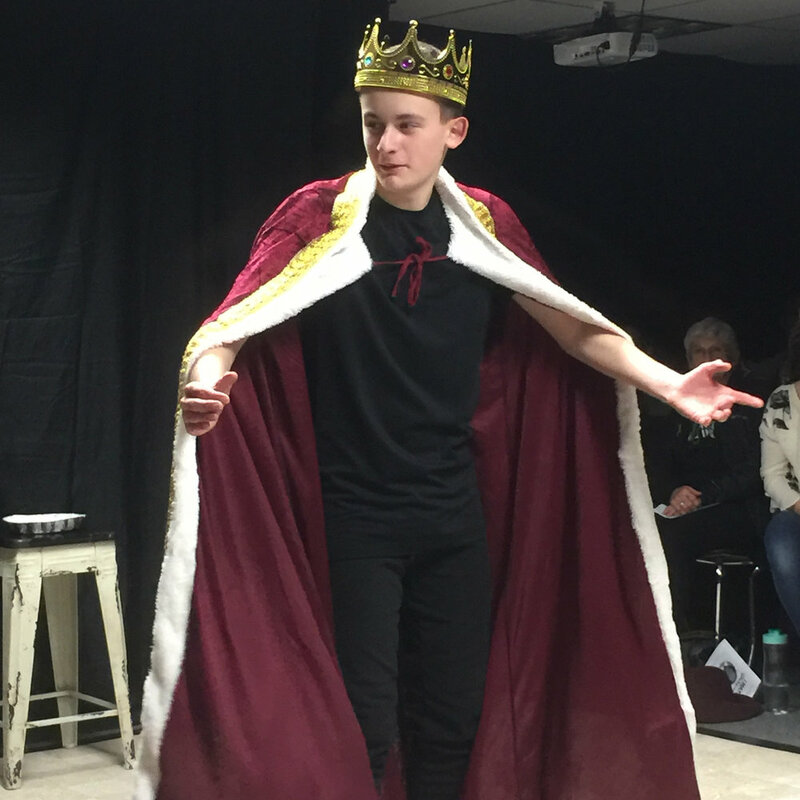 Hamlet served as our narrator and led us through an evening of side-splitting skits and spoofs. Thanks to the B.O.M.T.W.C.C.P. for closing out 2018 with two nights of highbrow hilarity. 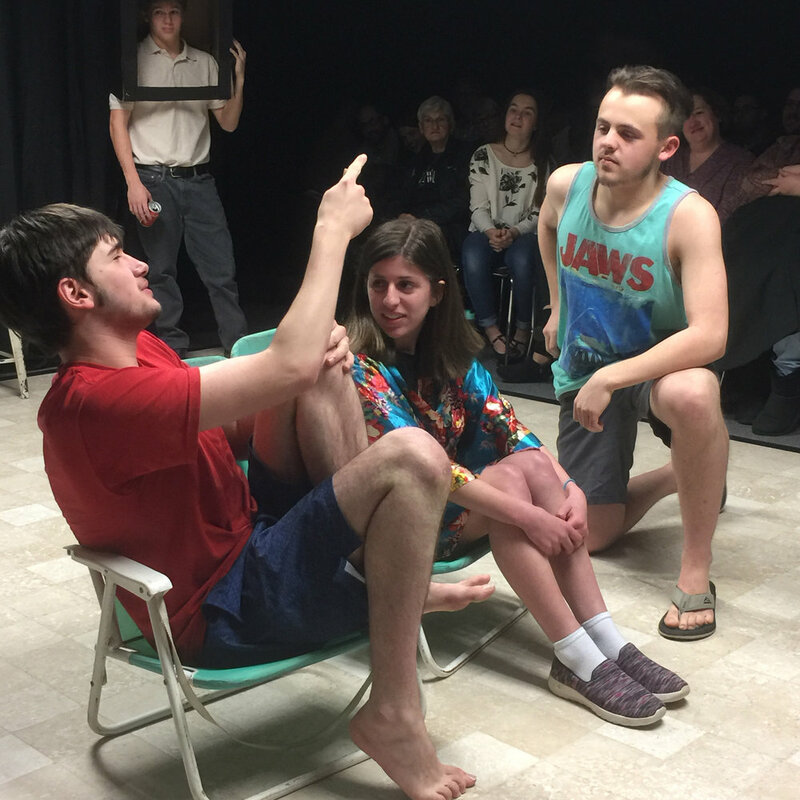 We are currently holding readings for our soon-to-be-announced spring production. 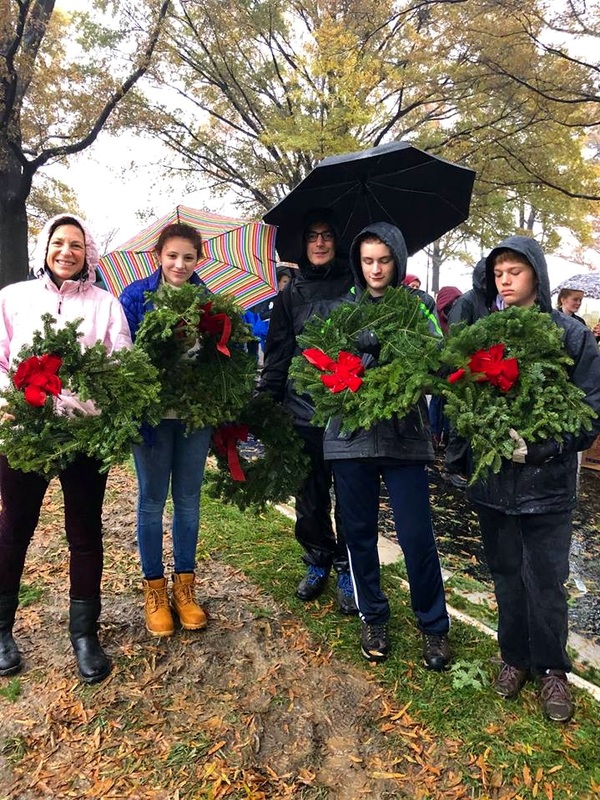 This past Saturday, some very determined GWCS Coyotes braved the torrential rain, to participate in ‘National Wreaths Across America Day’ by laying wreaths at Arlington National Cemetery. Despite the weather, the mood was positive! 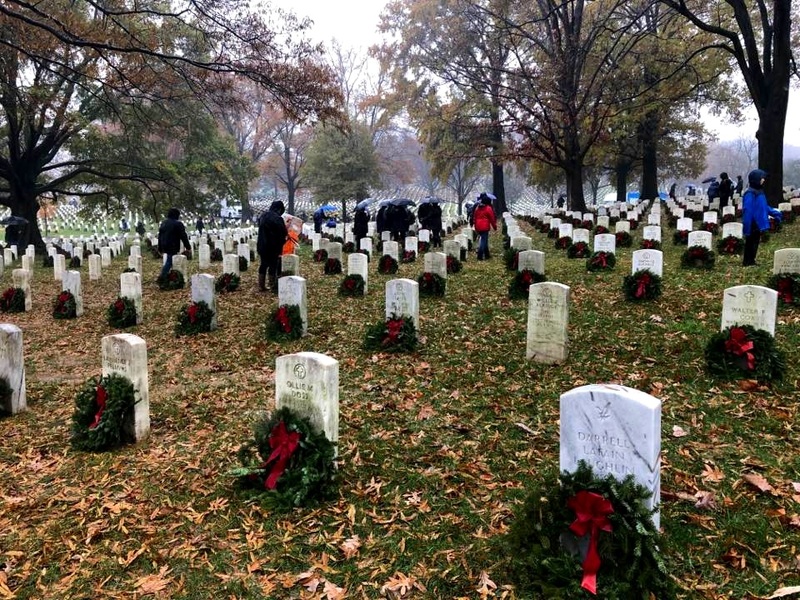 It was truly spectacular to lay a wreath, and then turn around to see the field of wreaths that had populated the cemetery. Truly breathtaking! While tough to coordinate, we did it, and considered it a major victory that we were all able to link-up, considering the thousands of volunteers that had shown up to participate. Jonathan and his dad, Emily (Betsy) and Laurie, Connor, EmmaGrace and eventually Ethan, all braved the elements to show true Coyote spirit with this volunteer opportunity. The rain was very small price to pay for the men and women who have served our Country! We look forward to better weather next year, so that more Coyotes can participate! Happy Holidays to everyone! 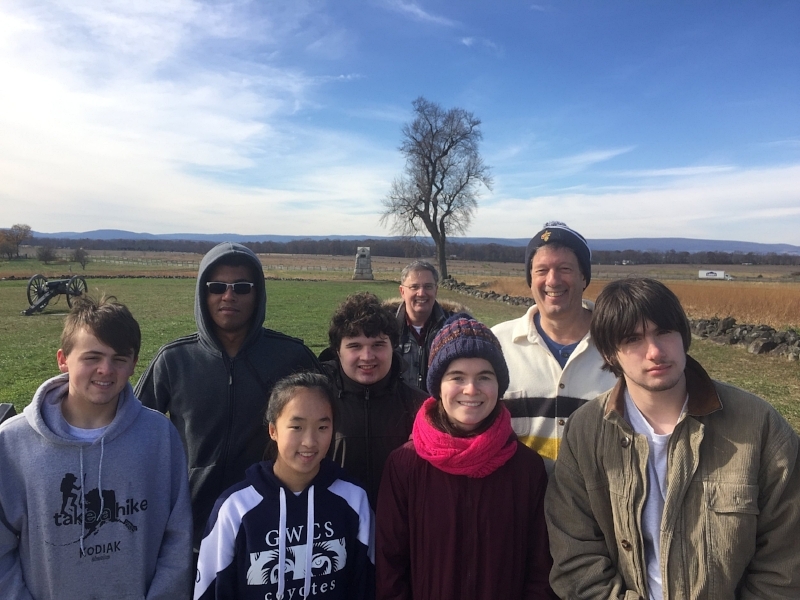 After watching the really, really, really long “Gettysburg” movie at school Tuesday evening, the juniors were back at GWCS at 6:00 am Wednesday morning for the annual junior class field trip to the Gettysburg National Military Park. After arriving at Gettysburg, we visited the National Military Cemetery where the remains of thousands of Union and Confederate soldiers, most unknown, are interred. The dedication of this cemetery was the location of President Abraham Lincoln’s immortal “Gettysburg Address”. Cemetery Hill was also a central location of the Union lines, and the area is full of cannons and memorials dedicated to those who fought there. Our next stop was to the Visitor Center, where we watched a moving film called “A New Birth of Freedom”, viewed the amazing Gettysburg Cyclorama, and toured through the museum. (Not enough time – need to return!) We then piled back into the school van and Mr. Wallace’s car to tour the battlefield directed by an audio tour guide. 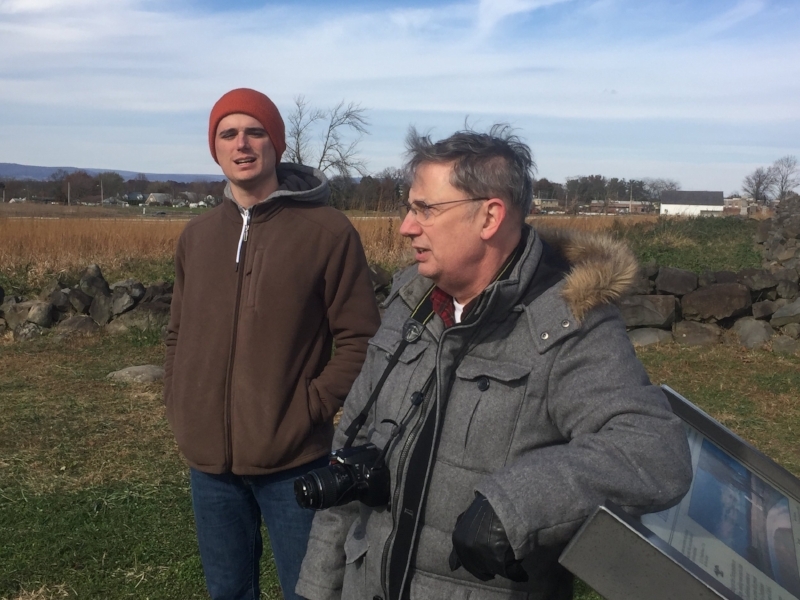 With an open call between Mr. Goldie’s and Mr. Wallace’s phones, Mr. Lindner holding Mr. Goldie’s phone against the car speaker, and Mr. Wallace’s phone plugged into his car’s audio system, we all listened to descriptions of the battle as we drove around the battlefield. We stopped at get out at the Eternal Light Peace Memorial, the State of Virginia Monument, and Little Round Top. From the Virginia Memorial, we repeated the annual GWCS Pickett’s Charge, walking the mile from where General Lee observed mounted on his horse to the Bloody Angle on Cemetery Hill where the Confederacy reached its “High Water Mark”. And back! Following the car tour, we retired to General Li’s Buffet for a yummy, filling and fun meal before driving back to GWCS. We had fun, learned a lot, and returned with a greater respect for the courage and commitment of those who fought there. GWCS, in conjunction with Coyote Robotics, Inc., sponsors two FIRST Tech Challenge robotics teams. This season we have three GWCS students and eight kids from neighboring schools participating on our two teams: FTC 965 “League of Incompetent Gentlemen” and FTC 3749 “Bionic Penguins.” GWCS robotics participants (both students and parents) met September 8 to learn about Rover Ruckus ™, the new robotics game challenge for the forthcoming competition season. Immediately following the meeting, participants began brainstorming how to design robots that will compete successfully in the challenge game. For the past two months our teams have met at least three times a week to strategize, design, build and test our two robots. Many possible designs were considered, prototyped and tested before reaching our current state with Team 965’s robot just about ready and Team 3749’s not far behind. We under a lot of pressure since the first of three qualifying tournaments takes place November 17 at Orange County High School in Orange, Virginia. We’ll report on our showing following the tournament. Go Coyotes! Go Gentlemen! Go Penguins! 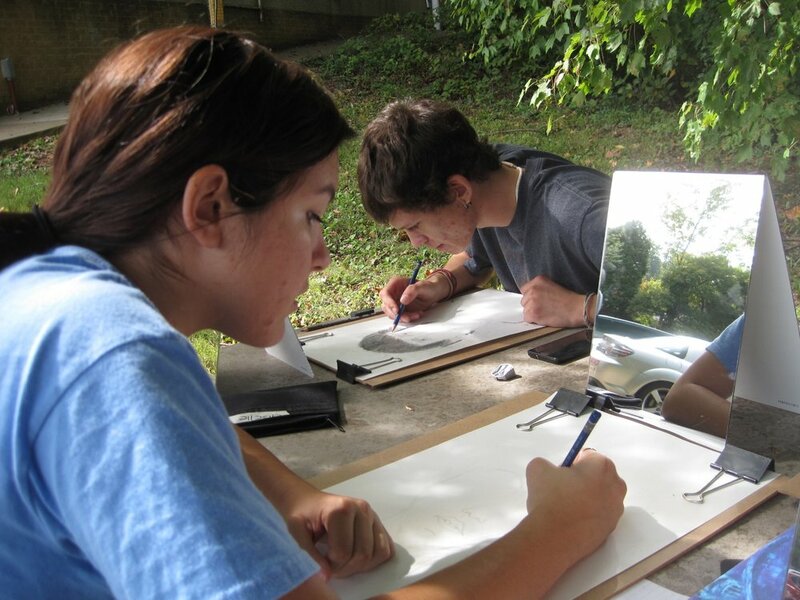 The GWCS ESTA (Ending Stigma Through Art) Club, newly founded this year, recently completed its first unit on poverty. After introducing the idea of stigma generally, and the negative impacts it has on vulnerable populations and society overall, we educated ourselves about poverty by engaging in discussions, taking quizzes, and learning about related statistics. After discussing and developing an understanding of stigma and poverty, we then spent a number of meetings focused on art that helped to break down or remove stigma about people who are challenged by poverty. We focused on a variety of different kinds of art, including: poetry (by Langston Hughes, Robert Flanagan and Julie Dinsmore), paintings (by Marc Clamage), editorial cartoons (by Jimmy Margulies, Barry Deutsch, and Angelo Lopez), and a TED talk (by Rutger Bregman). 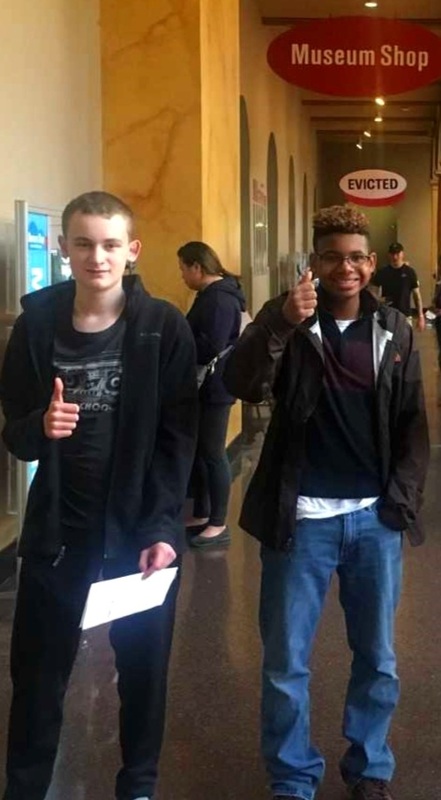 The poverty unit culminated in our group going to the “Evicted” exhibit at the National Building Museum. This exhibit powerfully portrayed the prevalence of the practice of eviction across America, a practice whereby people are removed from their home by court order against their will. This exhibit, through info-graphics, cardboard installations, photographs, and audio interviews, also demonstrated the many hardships that poor people endure due to unstable housing, including hardships related to family life, mental and physical health, jobs, school, and personal relationships. Additionally, the exhibit emphasized that eviction can happen to anyone from any background. However, the exhibit also noted, based on years of collected data, that eviction disproportionately affects African American single mothers in cities. Finally, this art exhibit left us with a feeling that eviction, and its related hardships, is a problem that can be solved, and that each of us can play a part in the solution. Create, Explore, Problem-Solve, Innovate, Express Yourself and Have Fun in APCSP! Pumpkins & Costumes & Doughnuts, Oh My! 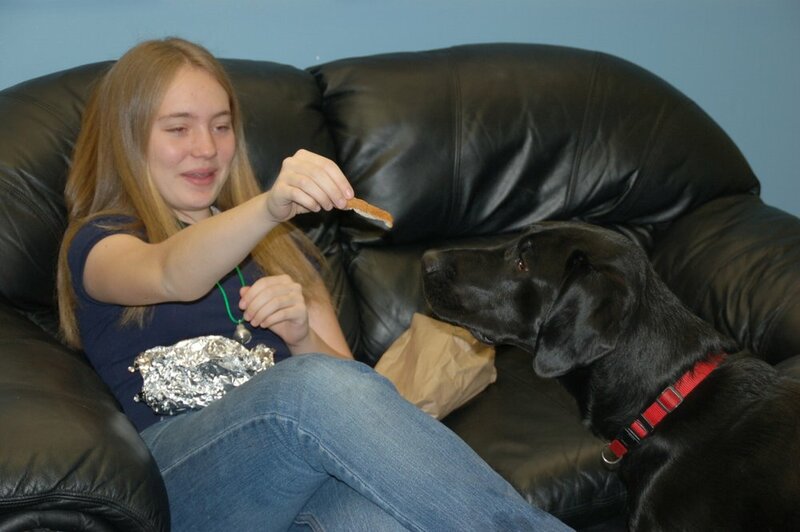 Our website was designed and built by Convergence, LLC, find out more about Convergence.